Currently, there are 14,030 decks in the EDHREC database running Day of Judgment and not a single one of them should have it as part of the 99. Welcome back to In the Margins, a periodic column where I tell you that you’re wrong. Everyone loves that, being told they’re wrong. Just stand there in your wrongness and be wrong and get used to it. And if you’re running Day of Judgment you’re wrong. Now I’ll do that thing where I acknowledge there are legit reasons to run the card, because there are. First, at four mana Day leaves you room to rebuild your game state post-wipe before anyone else. Getting that hasty dragon down for a swing into a blocker-free board can be huge. Second, some decks just want all the board wipes, whether it’s Avacyn, Angel of Hope or most superfriends decks. Third, Day of Judgement is like a buck, and that’s a big deal for the value conscious among us. Fourth, maybe you’re running a Mike Pence-themed deck and you want as many cards as possible referencing the end times or doing totally not creepy things like referring to your spouse as Mother. Those are all valid excuses. So why should you not run it? Because it’s the most basic of board wipes, the base model, the contractor’s beige. I mean, yeah, you could get your car without power windows and lower them with a hand crank like some kind of old-timey poor, but this is 2018; we’ve had electricity for thirty or so years at this point if my math is right. No reason to still live like peasants. And there’s even less excuse for it when you realize that Magic printed a strictly better Day of Judgment way back on day one in Alpha. Consumed by the desert in a sand storm which lasted a whole year. Wiped clean by the Wrath of God. 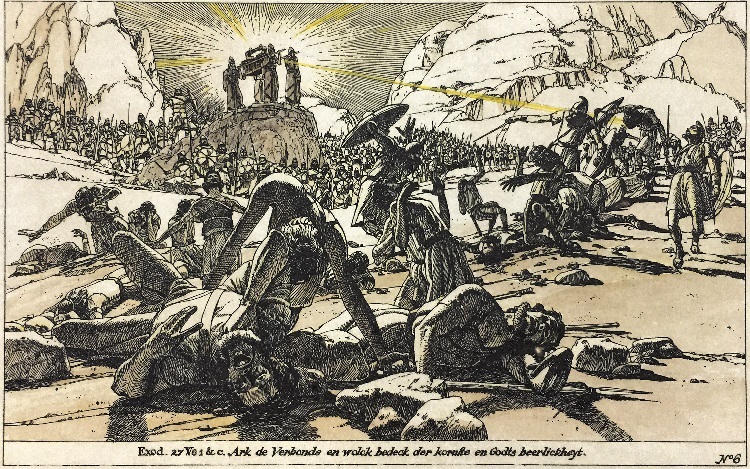 Wrath of God is an almost-always better Day of Judgment in that the creatures destroyed cannot be regenerated. I said almost-always and not strictly better because if your Commander itself has regeneration I can see an argument being made to downgrade to Day. Outside those few rare cases (Cromat and Ragnar being the two with white color identities and baked-in regeneration) you probably want to prevent the option. 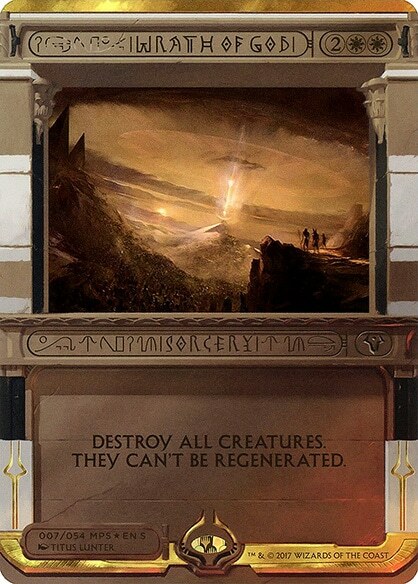 There are 206 creatures in Magic that can be regenerated or regenerate another creature as a base ability, and 14 commanders that can regenerate or regenerate another creature. That’s not nothing, particularly when you’re staring at a Thrun, the Last Troll strapped to four swords. As mentioned previously Day of Judgment is a bit more budget friendly than Wrath of God, but the difference is only about three dollars at the time of writing. Wrath also has significantly more printings showing up in 20+ sets to just 6 for Day of Judgment so finding one shouldn’t be a challenge. And unlike Day of Judgment, Wrath has actually shown up in a Commander set back in 2013. 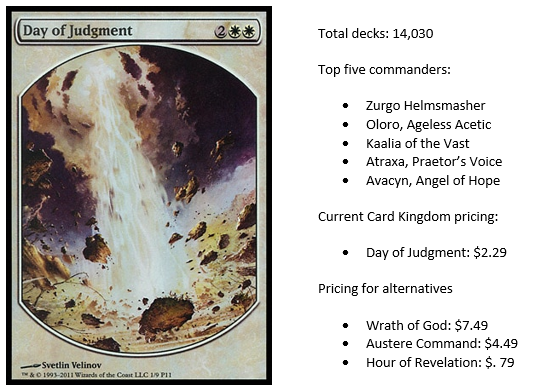 Still, looking at the most frequently played white commanders both in mono-white and in the four white color pairs we find each with 50+ decks in the database running Day of Judgment and not Wrath of God. Sram, Senior Edificer is at 50 exactly, Brago, King Eternal is at 118, Trostani, Selesnya’s Voice, Ayli, Eternal Pilgrim is at 84 and Aurelia, the Warleader is at 66. As I mentioned Wrath was included in a Commander set, namely the Nature of the Beast precon in 2013. This means Marath, Will of the Wild and Gahiji, Honored One came in decks with Wrath and without Day of Judgment. Still there are somehow 45 Marath decks running Day and no Wrath meaning those brewmasters pulled the better board wipe for the poorer one. The same holds true of Gahiji where 28 deck cooks have done the same. And by the same I mean “done the wrong thing”. Okay, so we’ve established Wrath’s Alpha status, literally as well as figuratively. Here’s where things get tricky; there aren’t any other mono-white board wipes to do an apples to apples comparison at that same CMC. Since there aren’t any perfect comparison cards we’ll start by looking at my personal favorite alternatives. Death has always surrounded it. It is not of this earth. Austere Command is one of the best board wipes ever printed, and is my personal favorite. Yes, it costs 2 mana more than Day of Judgment and Wrath of God. But those two mana get you an option to do almost all the things. You ideally want a board wipe to break parity, and Austere Command breaks parity more easily than any wrath printed. It’s currently in 12,842 decks on EDHREC and it should be in way, way more. A large part of that it has hovered in the $12-ish dollar range in cost for quite a few years, but the Iconic Masters reprint now has versions available for roughly the price of a Wrath. Pick up four, that way you’ll only be disappointed you didn’t buy five. Hour of Revelation looks like it costs six mana to cast, but it really only costs WWW to destroy all nonland permanents because basically you’ll never want to cast it unless you’re in a situation where the pseudo-Ascend trigger kicks in reducing it to a CMC of three. Hour of Rev is the best board wipe printed since Toxic Deluge, and people are going to figure that out sooner rather than later. Still, it hits pretty much everything in play, which can be great, and can be less desirable if you’re ahead or if you’re greedy. It’s in 1,796 decks currently, which is half as many as the almost always worse Akroma’s Vengeance. That should change over time as people realize just how much value is packed into this card for WWW. Terminus does work (or did at least prior to a banning) in a Legacy deck. That generally means it’s a fairly decent card. Apparently a one mana board wipe is good, particularly when the Miracle keyword can let you cast it at instant speed. Breya, Etherium Shaper is the second most popular commander on EDHREC. 842 of those Breya lists are running Sensei’s Divining Top, the card Legacy players relied upon to have access to Terminus at will. And of those 842 decks there are 23 running Day of Judgment over Terminus. 23 people are wrong. Things get a little iffier from here on out, but there are situations where all of these are worth it over Day. You want to talk to God? Let’s go see him together. 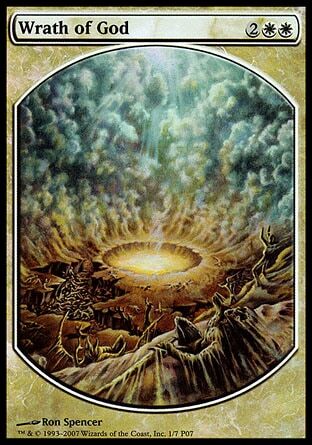 All is Dust forces a sacrifice of all colored permanents. This should primarily see play in artifact-heavy decks where you’ll suffer losses less than everyone else. Seven mana is steep, but forcing a sacrifice is really useful, and it can go in any deck. Less common but worth noting is that All is Dust is a tribal eldrazi card. This means you can technically fetch it from exile with Coax from the Blind Eternities, use mana from Eldrazi Temple to cast it, gain cost reduction on it with Eye of Ugin, or tutor it up by sacrificing From Beyond. Descend Upon the Sinful costs two more than Day but it exiles, and has a chance to leave you a 4/4 angel in the process if you hit Delirium. Is that worth two additional mana? Maybe in a heavy token deck running Doubling Season-type effects, or if you see a lot of indestructibles you want gone. End Hostilities costs one more mana than Day of Judgment, and it destroys all permanents attached to creatures. This means no Replenishing those auras back onto the Uril, the Miststalker and no Lightning Greaves or sword waiting to get re-equipped onto Rafiq of the Many next cast. This is also a bit of a meta call, but given the preponderance of equipment in Commander it’s generally worth the single mana even if it just deals with one lone Greaves or Swiftfoot Boots. Fairly often it’s going to destroy way more than that however. Final Judgment is a worse Descend Upon the Sinful, though it still shows up in just a shade under 1,000 decks, presumably because in Commander in general and in some metas especially exile matters. Ironically given the art features our favorite spirit dragon only 10 of those are O-Kagachi, Vengeful Kami decks. Fumigate costs one more than Day, but it gains you a few life. Or maybe like a gazillion life depending on how many bodies hit the floor. Again, it’s a meta call, but if you see a lot of token decks or ones that just run wide it might be worth the extra mana to stabilize your life late game, particularly if you’re playing a commander like Oloro, Ageless Ascetic who uses life as a resource. 413 Oloro players disagree with me, though. Hallowed Burial also costs one more than day but it tucks everything getting around indestructible, Grave Pact-type effects. The tuck change rule really hit Hallowed Burial hard but it still lives in 2,343 decks. Hour of Reckoning isn’t even the best “Hour of X” card on this list, and it’s still better than Day of Judgment pretty often. Like the previously mentioned Hour of Revelation you’ll almost never pay full price for Hour of Reckoning either thanks to Convoke. Mysteriously there are 24 Heliod, God of the Sun decks running Day over this Hour, despite the fact that he both makes tokens, and gives them vigilance allowing you to tap them for Convoke post-attack. Men will kill for it. Men like you and me. Martial Coup occupies similar space to Hour of Reckoning in that it probably sees most play in a token deck. It’s also a modular spell. Don’t need to wipe the board? Spend six total mana and make four 1/1 soldier tokens. Want to wipe the board? Spend more and wipe the board and also make soldier tokens. Everyone wins. And by everyone I mean you. And by wins I mean gets some soldiers that hopefully don’t die to a Pyroclasm. 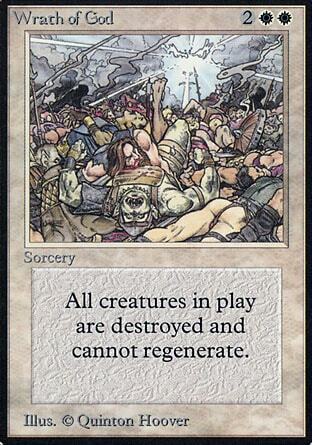 Phyrexian Rebirth costs six mana but it leaves behind a x/x colorless horror artifact creature token where x is the number of creatures destroyed this way. A vanilla x/x beater is uninspiring in EDH for the most part. See also: Goyf, Tarma. Still in a token or artifact build it might be worth considering. Rout is probably worth considering just for being Wrath of God for one more mana. Maybe you never see regeneration, but if you do turning it off for a single extra colors worth pondering. However for seven total you can cast Rout as an instant. Board wiping at instant speed can either save you from a game-ending alpha strike, or set up your own. Both are options I like. Winds of Rath destroys all creatures not wearing an enchantment. This is a Wrath that you’re probably only running in an enchantment deck, but if you can run it in your enchantment deck you absolutely are going to do so, right? Right? Daxos the Returned is the most popular commander on EDHREC in the enchantment theme catagory, and there are 121 Daxos decks running Day of Judgment but not Winds of Rath, because people hate winning I guess. We may as well touch on a couple of partially white cards as well since these are going to be options in some white decks. Lightning. Fire. Power of God or something. Blasphemous Act is absurdly, insanely efficient, and if you aren’t running it in a deck that can you better have a really good reason. The most common Boros commander is Aurelia, and there are 113 decks with her as their head running Day over Blasphemous Act. I guarantee those 113 people don’t have a really good reason. Supreme Verdict is an uncounterable Day of Judgment at the same CMC, swapping a colorless mana for a blue. I’ve cast this too many times to count, and not once ever have I wished I could have traded that blue mana symbol for a colorless in exchange for losing the uncouterability. I’m apparently weird like that because looking at the top three most popular Azorius commanders shows us 69 Brago, King Eternal decks running Day and not Verdict, and another 41 Grand Arbiter Augustin IV and 44 Bruna, Light of Alabaster making a similar mistake. Merciless Eviction is a great modular board wipe that lets you pick creatures, artifacts, enchantments or planeswalkers to exile. Note that ability is exile not destroy, so it hits indestructible things, avoids graveyard triggers, etc. If I’m running a white deck with access to black I’m running Merciless Eviction, full stop. Not everyone agrees, as 323 of the decks running the top five Orzhov commanders are using Day and not Eviction. And this is all before we get into all the black wipes that would be an option in various color combos with white. You just probably shouldn’t be running of Day of Judgment, for real guys. If you’re still running Day of Judgment odds are one of these options will work a little better for you, and over time a bunch of little betters adds up to a lot better. That’s gonna wrap it up for this edition of “Feed Dana’s ego by telling everyone they’re doing it wrong.” I’d love to hear your perspective on all the Day of Judgment alternatives, as well as any suggestions for future cars to cover in the column in the comments below. Any commentary is also appreciated, particularly if it’s really complementary and agrees with me and says nice things about my hair. Until next time, I’m Dana, and I’ll see you In the Margins.